For over 2 months we were treated to the wonderful works of over 40 local artists. And all of us want to extend the warmest thanks to all of the folks who shared their vision of the great neighborhood of East Somerville, as well as to the good people at Somerville City Hall and beyond, who helped make this groundbreaking exhibition a reality. While the pictures are now off of the walls, East Somerville spins on. And we encourage you not only to continue your urban explorations and interpretations, but to make yourself a real part of our community. Thank you for everything! AND STAY IN TOUCH, OKAY? First, HUGE THANKS to everyone who came out Thursday evening for our Opening Reception! There was a great crowd of participating artists, neighbors, media, Somerville luminaries, and art lovers. It was wonderful to experience such energy and support and interest from the community. A good time seems to have been had by all, what with making new friends and getting the first opportunity to tour the exhibition. We hope that you will find the chance to come enjoy the diverse work of all of the talented photographers exhibiting (43 in all!). Early reviews (as well as eavesdropping on conversations at the Reception) have been great. The Exhibition will run through January 2009. Please Come To The Opening Reception ! To launch the Interpreting East Somerville exhibition, we are throwing a shindig Thursday November 20 from 5:30 to 7:30pm at Somerville City Hall. And you are invited! Somerville City Hall is located at 93 Highland Avenue. 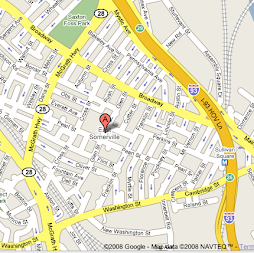 There is plenty of parking outside, and is served by direct bus lines from both Davis and Lechmere T stations. This will be a fun wonderful opportunity to meet many of the participating photographers, and be the first to tour this first-of-it's-kind exhibition. An amazing collection of local artists have been chosen to share their work! The Entry Period Has Closed, And . . .
We've gotten a whole bunch of wonderful submissions. It's going to be a great exhibition! We expect over 40 pieces to be shown. The organizing and all of that stuff is going on now. We'll have a more formal announcement of everything very shortly. In the meantime, please note that the opening date for the exhibition has been moved back to Thursday November 20. There will be an opening reception with many of the participating photographers, food and drink, and maybe even some live bossa nova. Mark your calendars! And stay tuned to this space for info and details to be posted as soon as we know them! You are invited to be part of an exciting new photographic art experiment ! Interpreting East Somerville takes one neighborhood as its subject, and invites you to bring your perspective (and your camera!) and interpret what you see and how you see it. The possibilities are as wide as your eye. Show the world. Show your world. Deadline to enter is October 25, 2008. Chosen entries will be exhibited throughout Somerville City Hall as part of a group show beginning November 20, 2008. Interpreting East Somerville is a juried exhibit. Entries will be judged on originality, photographic quality, and how well the images capture a unique flavor or perspective of East Somerville. As many entries as exhibition space allows will be considered. 1. Take photos somewhere in East Somerville! 2. You can submit up to 3 pieces for consideration. 3. Include your name, address, phone and email, and any special information about your entry. 4. Entries must be submitted by the actual photographer, or a friend or relative. Contact info for both the photographer and the person submitting the work is required. Chosen entries will be asked, if possible, to provide a high quality print of the final piece. Unless specified, chosen photos will be reproduced at an 8x10 size. Collages, digitally retouched photos, and multidimensional works will also be considered. Final selections will be exhibited, along with photographers credits, throughout the public concourses of Somerville City Hall beginning November 20, 2008. Interpreting East Somerville will be exhibited beginning November 20, 2008 at Somerville City Hall, located at 93 Highland Avenue. We extend great thanks to Mayor Joe Curtatone for inviting this unique community photographic exhibition to transform the public concourses of City Hall into a vast gallery space open for all. We would talk to 10 people and get 10 different answers . . It's colorful, it's grey, it's funky, it's staid, there's nothing new, everything is changing, they love it, they hate it, they would only pass through, they would never leave. And we realized that East Somerville, like our world itself, is whatever you say it is. And however you see it. Now we are inviting you to come see it, and show it, and tell it as only you can. It is there for everyone to see. But only you can see it as you do. The subject of this groundbreaking exhibition is one place in one city on the map. But it is your expression of this one subject that will become the works of art that are created and exhibited. Whether an exercise in sharing secrets or reveling in discoveries, your interpretation will create the narrative that is this living and evolving neighborhood. Comprising most of the eastern third of Somerville, Massachusetts, the neighborhood of East Somerville is the mostly densely populated section of this most densely populated city in New England. Historically a working class neighborhood, East Somerville is a vibrant mash-up of contradictions and confluences. Growing Central American, Brazilian, and Haitian communities jostle for space alongside the byways and commercial strips of this eclectic district with families and businesses that have remained in the neighborhood for generations. Whether for reasons of class or ethnicity or generation or something else, the neighborhood carries with it the vibe of a place separated. So close to the gleaming towers of downtown Boston, yet somehow distant. A part of the trendy booming city of Somerville, but somehow not. Two shops sharing a common doorway, yet worlds apart. Despite these curious disconnects, East Somerville stands out as an uncommonly friendly and gregarious and open place. This peculiar dynamic creates a unique and fascinating district unlike any other in the region. East Somerville continues to evolve as an organic urban creature that can reveal both it's crassness and it's gentle grace within a matter of a few steps. And each new day, the neighborhood awakens as its own diverse manifestation of the lives and perspectives that become a part of it. East Somerville can be accessed from the Sullivan Square MBTA station on the Orange Line. The Lechmere MBTA station on the Green Line is about a 10 minute walk from the edge of the neighborhood. Numerous buses service East Somerville and Sullivan Square including the CT2, 80,86, 87, 89, 91, 93, 101.